Looks very good. Excellent when you wear it with a t-shirt . Add a classic accent to your ensembles with this pretty gold-filled figaro-link chain necklace. A classic style for both men and women, this necklace features flattened links with an alternating pattern of three short links followed by a longer one. It's golden-bronze coloring promises to complement virtually any accessory, offering a contrast to darker gems and a subtle shade of difference with other light metals. This finely crafted gold filled necklace features a high polish finish making it stand-out and will immediately update your jewelry collection. The Figaro link chain is a timeless gold accessory that can be worn everyday for an added glamorous touch. This womens or mens gold necklace secures with a lobster claw clasp that is comfortable and provides sturdiness. For a more fashionable approach, layer this one of a kind gold necklace with other gold chains. 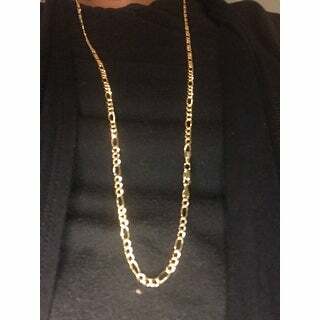 This 14k gold filled necklace is a great gift idea for yourself or a loved one for occasions such as birthday, graduation, holiday, Mother's Day, Father's Day, Valentine's Day, or any special occasion, as this designer chain necklace is a definite must have. This necklace is well suited for women or young girls. 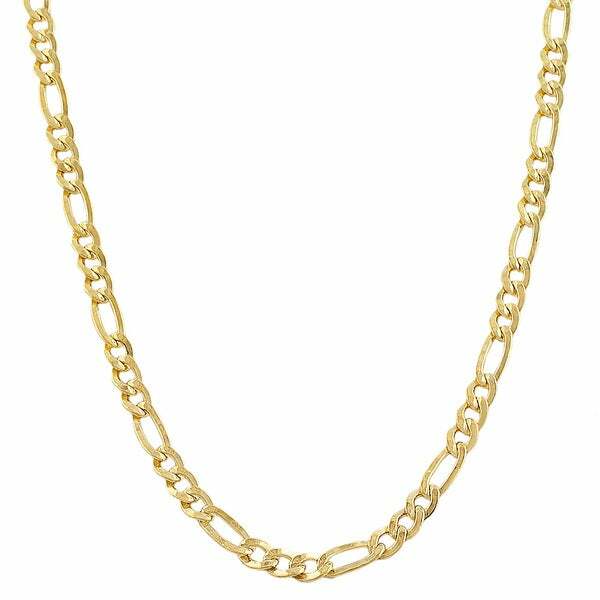 This gold filled chain is 3.3 millimeters wide, making a bold statement worn solo. This 14k gold filled necklace is offered in a variety of lengths from 18, 20, 22, 24, 30, or 36 inches long. All carat weights and measurements are approximate and may vary slightly from the listed dimensions. See Treatment Guide for further information. The piece looks like a solid gold necklace. The quality of this gold filled piece is remarkable. The chain changed colors after a few wears! The clasps turned really dark also. I love this chain necklace. It's light and beautiful. This was a great purchase. This chain necklace is plain and simple but still nice looking. Its light in weight and its not to overwhelming. If you're looking for something that stands out this isn't for you it's more of a simple piece of jewelry. I do recommend this for those who doesn't want their jewelry to stand out the shipping was very fast and the item came delivered undamaged. Well prided gold filled chain. I would recommend the purchase. As with other Fremada jewelry, I wasn't disappointed with this lovely necklace. I layer with additional gold necklaces, and get many compliments. Great purchase. I love my Figaro Link Chain, I wear it for special occasions and yes I would recommend it to my friends. this necklace is very nice and I use it with a gold pendent. It was much nicer than I was expecting! Heavier and better material than most chains I saw at any store for an amazing price. Highly recommend. The chain was nice but I had to return it due to poor packaging. It showed up in knots bcuz Overstock doesn't ship using appropriate jewelry packages and simply dropped the chain in a small ziplock bag. I did inform them that that was not a good idea so hopefully they have changed there practice of shipping. Bought this chain for my wife and she loved it. It looks and feels right. I will definitely come back for more. It's not good it changed colors quickly. Bought this chain for my son and he loves it. Quality of the gold is good. He has taken showers and everything wearing this chain. The chain was just what I wanted and I will be ordering more. GREAT DEAL!! I love how fast it shipped and it came exactly how it was described. Telling all my friends tnat overstock.com is the place to order from. Price was awesome too!! had to get a bigger chain it was to short for me but this is second one iver ordered and i love it ! I brought this chain for myself. I put my tree of life pendant on it. It looks very nice. And would even be nice for a younger person..this chain is a great buy. "Can I shower with this on without the chain being ruined"
Yes you should be able to shower with this on, just be more careful and mindful when applying oils or perfumes or colognes so nothing gets tarnished. "What is the weight of the 36 inch?" "Wearing this chain on your neck and will the salt from sweat fade the gold filled chain"
No, that should not be happening. I hope this helps. "will this chain turn black on skin or itself"
This chain did not turn black but the finish did become dull after constant wearing for 3 or more months. The minimal cost and the 30 inch length. Bought rare coin needed nice chain just to ware with it.I broke last one I had due to lack of care, will be more reasonable with this one.